With change management we can capture and drive the amount of project benefits dependent on adoption and usage. By quantifying the people side benefit contribution, we can calculate the change management return on investment (ROI), providing content for meaningful and enlightening conversations with project leaders and executives to build buy-in and commitment to change management. 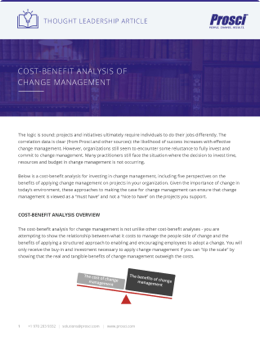 The ROI of change management is the additional value created by a project due to employee adoption and usage. The process below empowers you to capture and express a quantified value for change management's contribution. To begin, let's define return on investment (ROI). When we divide the net benefits (benefits - costs) by the project costs, we calculate the value captured by undertaking the effort. Project leaders and senior leaders are comfortable and familiar with this sort of analysis. In order to shift the change management ROI (CMROI) discussion, let's break apart the expected project benefits. Some of the benefits will be independent of adoption and usage. For example, suppose we are replacing a particular software program that has lower maintenance and license fees. Those benefits are achieved regardless of adoption and usage. Those would fall into the first category, "Independent of adoption and usage." The other branch of expected project benefits includes those that are in the category of "dependent on usage and adoption." Suppose our new software program not only has lower maintenance and license fees (the independent benefits), but if it is used proficiently by employees, it produces more accurate and timely data, increasing performance and reducing errors. Those additional benefits result from impacted employees adopting and using the new system effectively. The amount of project benefits that are dependent on adoption and usage is what we can capture/ensure/drive/realize through change management. With that foundation, here are two examples that illustrate the people side benefit contribution, which is what we will call the project benefits that are dependent on adoption and usage. So, both Project A and Project B have the same expected project benefits ($1.3 million). However, we intuitively know that the benefits associated with a hardware upgrade and those from a process optimization are different. We'll add a line to our table that addresses the people impact of each project. Quite small. Only a handful of employees are impacted in terms of their day-to-day work. Quite large. Many employees will have to do their jobs a new way, and it is their adherence to the new processes that ultimately drives much of the expected value from optimization. What would the expected benefits be if adoption and usage were 0? By subtracting the expected benefits when adoption and usage are 0 from the expected project benefits, we arrive at the amount of project benefits tied to adoption and usage—what we are calling the people side benefit contribution. The graph below shows the expected benefits, broken down by those dependent on adoption and usage (or the people side benefit contribution) and those that are independent of adoption and usage. We could take a final step and divide the people side benefit contribution into the expected project benefits. With Project B as an example, this does not mean that 73% of the benefits come exclusively from the people side of change and only 27% come from the technical side solution. The technical side of the solution must be sound and be able to deliver intended project benefits as it is what employees must ultimately "adopt and use." In other words, this model operates on the assumption that the technical solution is effective and robust. With the assumption that the technical solution is effectively designed, developed and delivered, the adoption and usage of that solution (in Project B) generates 73% of the expected project value. Keeping in mind the examples above, change management will have a smaller impact (and a lower ROI) on Project A (the hardware upgrade) than on Project B (the process optimization), as more of Project B's results depend on employee adoption and usage due to the nature of the change. What is the expected benefit of the project? What if no employees adopted and used the system? Not only is this data valuable, you will also find value in engaging with project and senior leaders to collect these numbers. With these two end points, you can analyze and model the impact of change management. The framework presented below gives you an approach to discuss the contribution and value of change management concretely and quantifiably. With the people side benefit contribution and the people side benefit coefficient, you can have new conversations with project leaders and senior leaders.